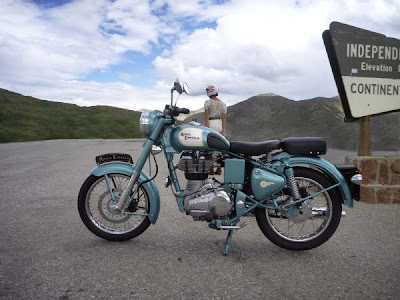 This is an excellent photo of a Royal Enfield for sale. This blog lists Royal Enfield motorcycles for sale in the United States if (and usually only if) the ad is accompanied by a photograph. Some sellers provide fantastic photos of their motorcycles. Some sellers put a red pick-up truck and an overflowing garbage can in the background. The temptation is to use the PhotoShop program to empty the trash can (by erasing the overflow) and turn the pick-up gray, so that it melts into the background. I admit I have done both to the pictures on this blog, to put the emphasis on the motorcycle. Even more tempting is the occasional good photo that could be great with only a few alterations. I was captivated by the photo above of a Royal Enfield C5 for sale in Colorado. 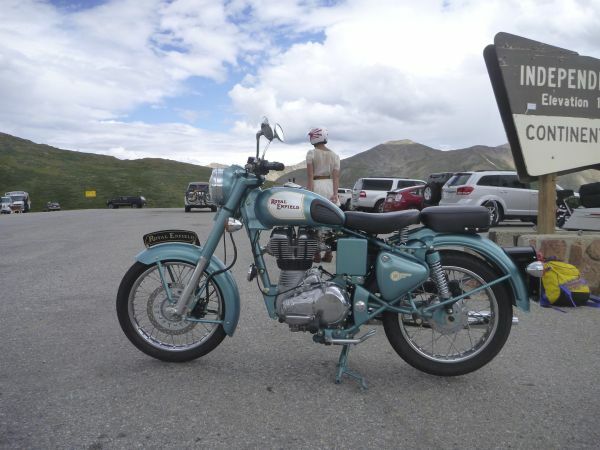 The young woman in the background was positioned perfectly, I thought, and the Continental Divide sign told you the location. I erased the other vehicles in the parking lot, leaving the young woman and the sign or, sometimes, removing the sign. Here's the same photo with distracting elements eliminated. Which photo draws more attention to the ad? One is probably no better than the other. But I would rather look at the After picture. It's fun, frankly, to play with other people's pictures. These are liberties I could never take when I was a photo editor for The Miami Herald newspaper. At the newspaper we used PhotoShop to crop and caption news and feature photographs, but altering them was taboo. This was honest and ethical but I don't claim that we didn't influence what the photos showed. First, talented photographers "edit in the viewfinder." Where they point the camera and when they push the button makes a big difference. And then there was editing. A photographer who shot two rolls off film (back when cameras used film!) captured 72 versions of the truth from an assignment. Only one would be chosen for the newspaper. I'll never forget the time photographer Mike Stocker showed me two pictures of a woman holding a trophy. "This is what it looked like when I got there," he said, showing me a picture of the woman and trophy inside a ridiculously disorganized and cluttered garage. "And this is the picture," he said, showing me the finest photo you've ever seen of a woman holding a trophy. Mike had the woman stand just outside, in the light, and he turned off the light in the garage, creating a solid dark background behind her. I'd argue that both photos were "true," but one was more effective than the other.